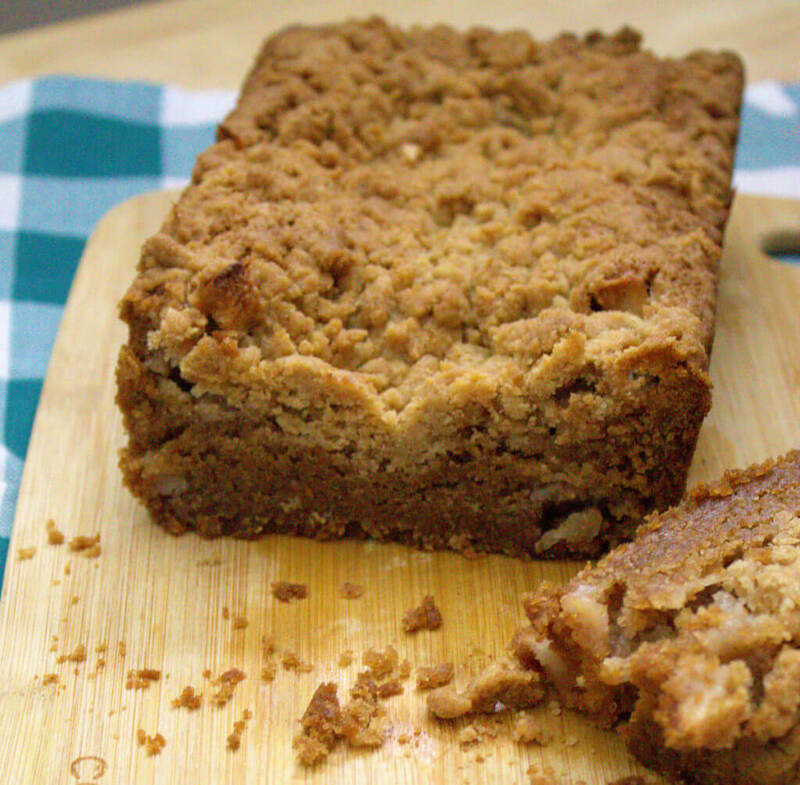 Consider this your new favorite coffee cake, except it’s technically a bread. This apple bread with crumb topping is so moist and sweet you probably couldn’t tell the difference any way. 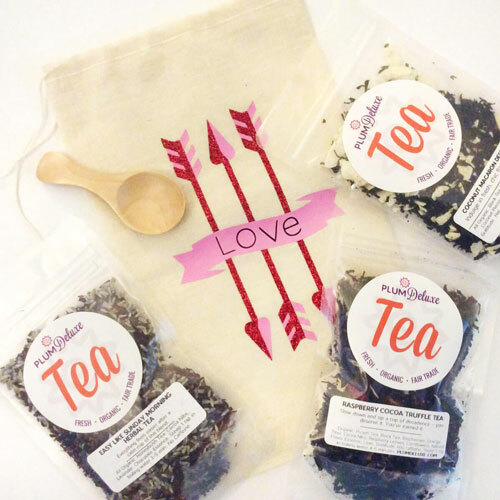 It’s the perfect thing for a quick breakfast, snack, or after dinner treat. You just might end up having it for all three and finishing a whole loaf in one day like we did. This stuff is addictive. This bread is also a great way to warm up the house on a winter’s day. 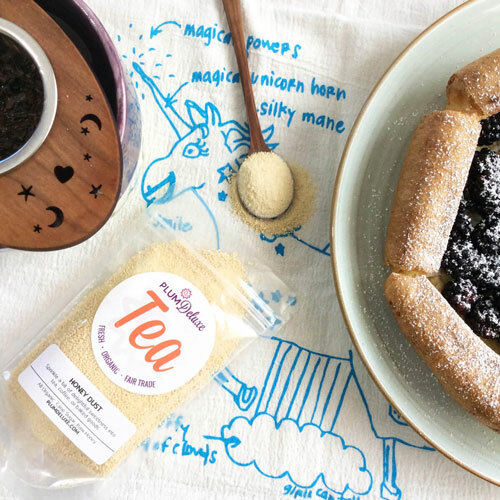 Whip up the dough in the morning and let it bake in time for afternoon tea. If you want to get ambitious you could also try out our Glazed Lemon Poppy Seed Tea Bread and Easy Chocolate Chip Cinnamon Bread. Serving this trio together is a sure way to please your guests as well as stave off the winter blues. 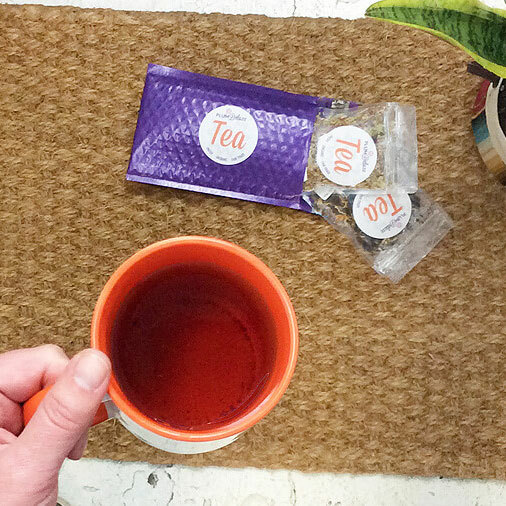 Who could be down when there’s this much goodness hanging around the house? If you want to up the sweetness factor even more, drizzle a little vanilla glaze, honey, or caramel sauce on top of your apple bread just before serving. Your guests will be blown away. Trying to make it a more savory dish? 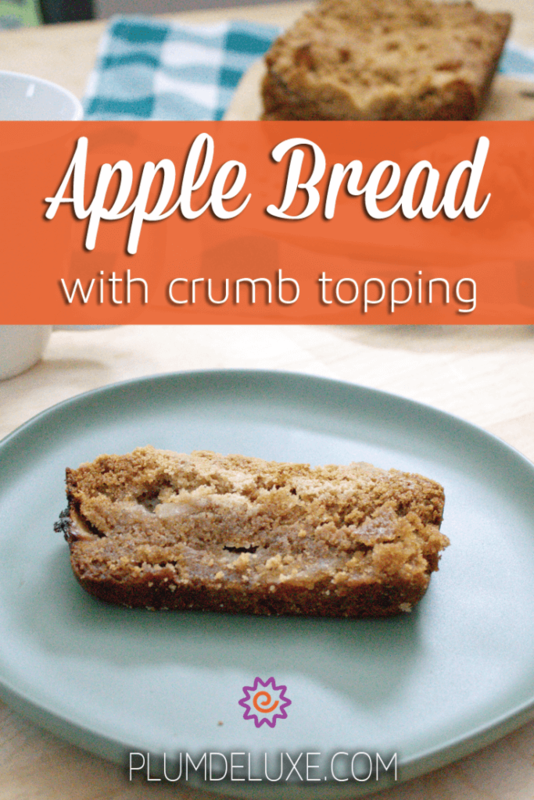 Then skip the crumb topping and you’ll get something more similar to banana bread. Additionally, you could add a little clove, nutmeg, ginger, or cardamom to make it a bit more savory or just for a change of flavor. If you just plan to enjoy this bread on its own, we think it goes best with a strong chai, like our Full Moon Chai. 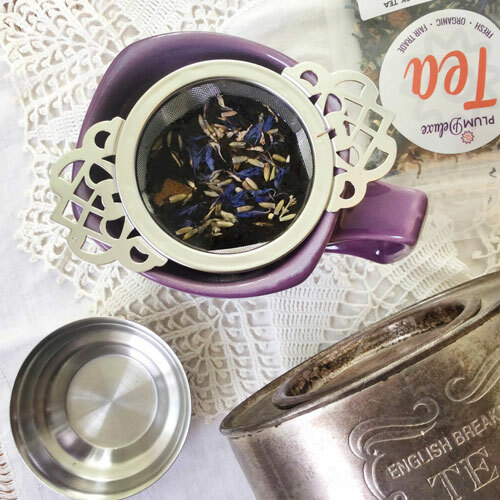 However, if you are interested in trying out all three recipes or even just serving the bread as part of a larger menu, we suggest going with something a little more neutral like our House Blend or Heritage Blend black teas. 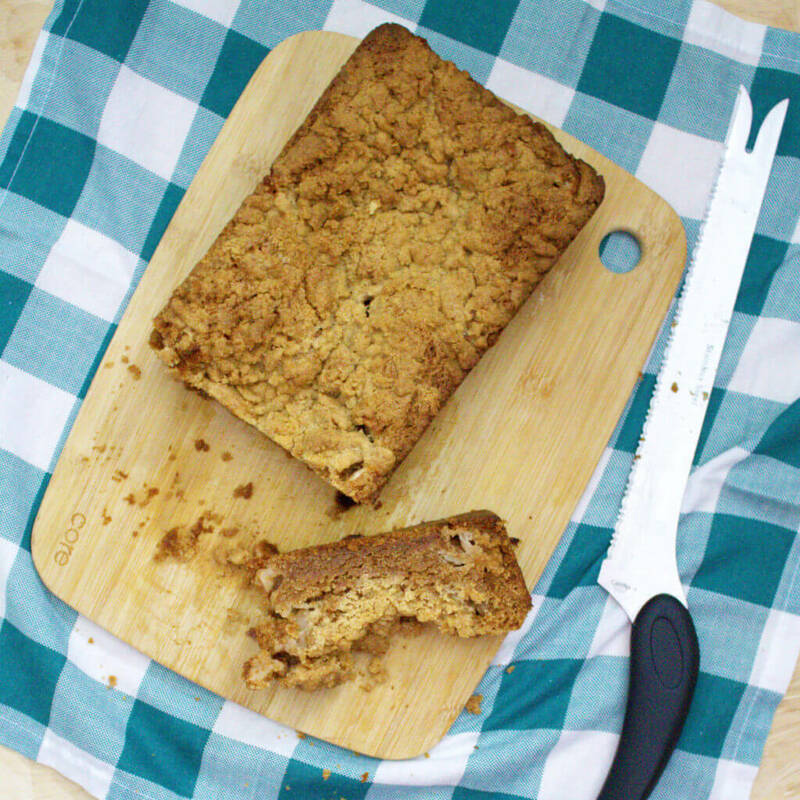 An extra bonus with this apple bread recipe is that it’s vegan; we swapped the eggs out for applesauce. Not only does this make it just that much more apple-y, but it also makes serving a large crowd a little easier. Having a bread this delicious that also meets some dietary restrictions is always a good thing. (Note: The crumb topping is not vegan.) If you don’t happen to have applesauce on hand or simply want to make a non-vegan version, swap out the applesauce for two large eggs, beaten. In a large bowl, combine all the dry ingredients until well mixed. Create a well in the center of the flour mixture and add the oil, applesauce, and vanilla to the center. Begin mixing the wet ingredients while slowly incorporating the flour mixture from around the edges until a wet dough forms. Gently fold in the apple. Spread the mixture out in the bottom of a greased loaf pan. In a small bowl, combine the crumb topping ingredients until large clumps form. Crumble mixture over the top of the batter and place the loaf in the oven for 1 hour and 20 minutes. Let stand 5 minutes. Remove from pan and serve.